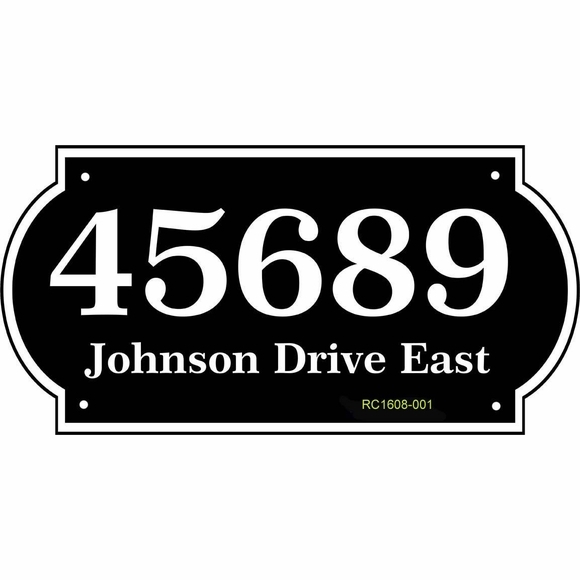 Personalized 16x8 Home Address Sign - - one line or two line enhanced rectangle plaque. Made in the USA. Large 16" x 8" address sign made from sturdy and UV-stabilized laminated acrylic. Engraved personalization. Customized with your choice of color and one or two address lines. Note: If you are ordering a one-line sign, please leave the Line 2 input box empty. On a one-line sign, Line 1 holds either four (4) 4" characters or five (5) 3" characters (including spaces and punctuation). On a two-line sign, Line 1 holds a maximum of five (5) 3" characters, and Line 2 holds a maximum of eighteen (18) 1" characters (including spaces and punctuation). Narrow border is the same color as the personalization and accentuates the enhanced rectangle shape. Dimensions: 16" x 8" x 1/8". The enhanced rectangle sign is also available in a smaller 12" x 6" size (see Related Products).